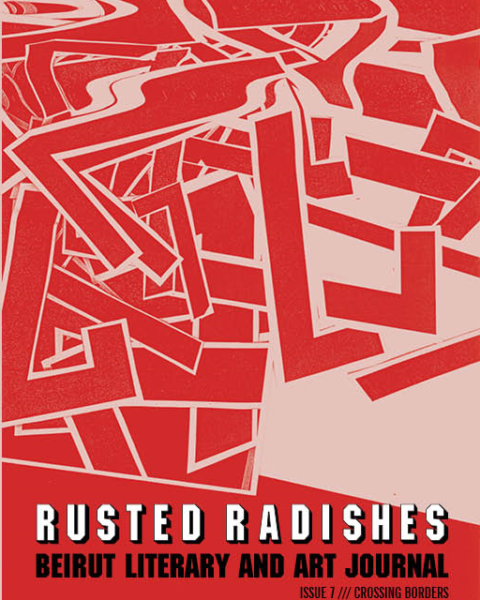 Rusted Radishes: Beirut Literary and Art Journal was founded by English Department faculty Rima Rantisi and Crystal Hoffman of the American University of Beirut in 2012 with the intention of creating a space for both emerging and established writers who have a connection to Lebanon. Over the years, we have published diverse work from bordering countries, the diaspora, and beyond. As we evolved, we opened the submissions to people connected to the MENA region. We do not insist on creating geographic borders for submissions, but we do acknowledge that Beirut’s revolving door of influences and cultures, its history, and its perch on the Mediterranean, is certainly at the heart of a unique convergence of voices. The work at RR is a truly interdisciplinary endeavor as we publish writing, translations, artwork, and graphic narratives and have recently accepted submissions in Arabic. The journal is edited and designed by a staff of faculty, students, and alum from both the Faculty of Arts and Sciences and Department of Architecture and Design at AUB. To date, RR has had over 65 interns from various disciplines at AUB, and boasts four faculty editors from the departments of English and Architecture and Design. In 2017, the Center for Arts and Humanities at AUB awarded the journal a grant to build a website so that we could expand our reach farther than print publication can. We look forward to meeting all the new writers and artists that the open borders of the internet allow us to greet. During the 2017-18 thanks to a grant from the Center of Middle Eastern Studies at AUB, RR co-hosted the Tarjamat series for Translation Studies and Writing founded by Dr. Rana Issa, Professor of Translation Studies at AUB. This series invites translators and writers from around the world to discuss their craft and special topics. Past guests of our series have included Yuri Herrera, Lisa Dillman, Humphrey Davies, Magdy Shafee, Marilyn Hacker, Suneela Mubayi, Lina Mounzer, and Chip Rosetti. We will continue the series during the 2018-19 academic year with Golan Hajji, Nael el Toukhy, Philip Metres, and Jeffrey Leong. We look forward to continuing this series into the future to nurture this cross-pollination between cultures, writer-translator, and the work we do in Beirut with the rest of the world.